News From Space! 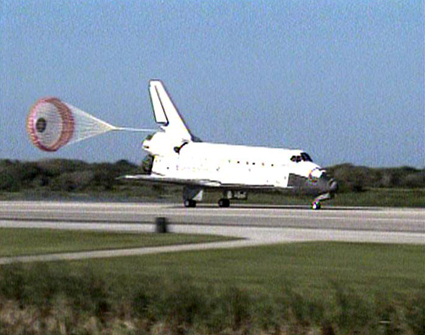 » STS-132: TOUCHDOWN! "Space Shuttle Atlantis now comes home to the Kennedy Space Center for the final time. Twenty-five years, thirty-two flights and more than 120 million miles traveled - the legacy of Atlantis now in the history books". "We'll... turn this incredible machine over to the ground teams to put her back in the barn for a little bit". With Commander Ken Ham and Pilot Tony Antonelli at the controls, space shuttle Atlantis descended to its final planned landing at Kennedy Space Center, Fla. The STS-132 crew concluded its successful mission to the International Space Station when the shuttle touched down at 8:48 a.m. EDT. The crew began its mission May 14 and arrived at the station May 16. Using the station’s robotic arm, Mission Specialists Piers Sellers and Garrett Reisman added Rassvet, the Russian Mini-Research Module 1, to the station. The new module will host a variety of biotechnology and biological science experiments and fluid physics and educational research. During three spacewalks Reisman, along with Mission Specialists Mike Good and Steve Bowen, added a backup high-data-rate antenna to the station and a tool platform to Dextre, the robot-like special purpose dexterous manipulator. They removed and replaced six 375-pound batteries on the station’s P6 truss segment. STS-132 is the 132nd shuttle mission and the 34th mission to visit the space station. The next mission, STS-133, is slated to launch in September. Live coverage at SpaceVidCast. Live video at SFN and Florida Today. Discussion at Nasaspaceflight. Pics and video at KSC. More clips at Space Multimedia. Check the links at right for play-by-play and NASA TV.